In small saucepan, melt candy coating over low heat, stirring constantly until smooth. Line cookie sheets with waxed paper. Holding cookie with tongs, dip entire top and side of each cookie into melted coating, letting excess drip off. Lay flat, coated side up, on waxed paper-lined cookie sheets. Place 2 chocolate chips in coating to form eyes. Let stand about 10 minutes until set. 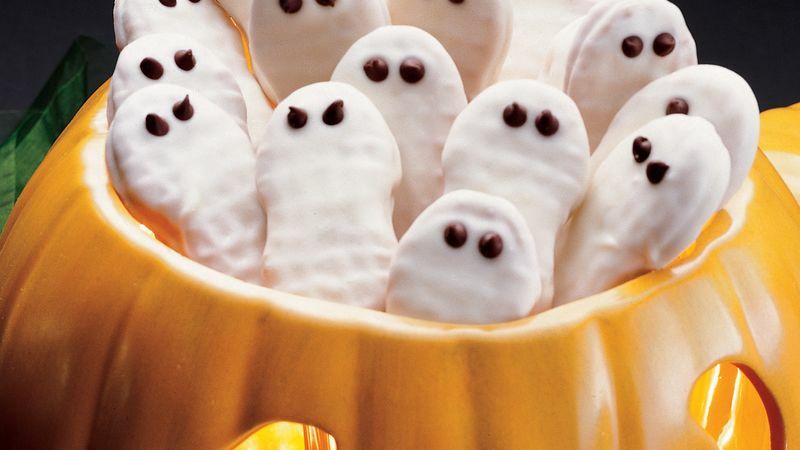 If children are helping, allow coated ghosts to cool a bit before allowing the kiddies to place the mini-chocolate-chip eyes on each figure.